The home appliance industry – which includes electrical or mechanical devices used in a household – is a multi-billion dollar industry, with consumption of household appliances worldwide forecasted to generate nearly 590 billion U.S. dollars in revenues by 2020. The leading companies in the industry include the Chinese Haier Electronics Group, the U.S.-based Whirlpool, the German Bosch and Siemens Group, the Swedish company Electrolux, and the South Korean multinational giant LG Electronics. The home appliance industry is divided into two sectors: major domestic appliances and small domestic appliances. The first category includes large machines used at home, such as, freezers, stoves, and washing machines. Sales of major appliances generated an estimated 180 billion U.S. dollars in revenue in 2017. The second category, small domestic appliances, includes products such as food processors, toasters and coffee makers, to name a few. A growing and promising sub-market within the home appliance industry is the smart appliance market. Washing machines, refrigerators and room air-conditioners are projected as the main appliance categories within the smart appliances market worldwide in 2020. Also in 2020, China is forecast to be the major market for smart connected major home appliances, as the country is projected to account for almost half of the global market by that time. 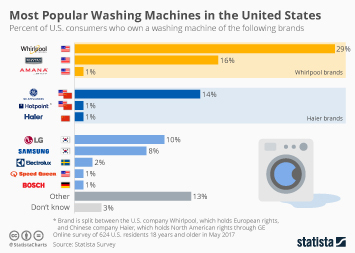 Topic: Home/household appliances in the U.S.